Two sumo wrestlers have been banned for life and the head of sumo's governing body has resigned amid a drugs scandal that has shaken Japan's national sport. The two Russian wrestlers were banned after testing positive for marijuana in random tests which began after a third wrestler was arrested for possession. 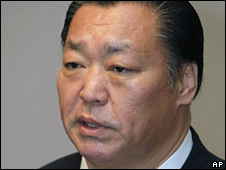 Chairman of the Sumo Association Kitanoumi also stepped down to take responsibility for the scandal. The sumo world is very conservative and wrestlers are held to high standards. "I bear the responsibility," said Kitanoumi, a former grand champion who mentored one of the Russian wrestlers. 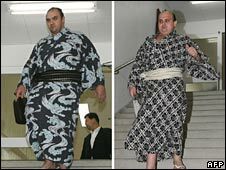 "I am offering my resignation out of my own volition because I have troubled the Sumo Association and its fans. I must reflect deeply by myself," he said. The scandal erupted last month when a Russian wrestler, Wakanoho, was arrested and subsequently banned for possessing marijuana. The Sumo Association then tested all 69 wrestlers in the sport's top two divisions. Two more Russians, Roho and Hakurozan, tested positive for the same drug. Both wrestlers deny using marijuana. But the Sumo Association says a second test has confirmed the initial findings. At an emergency meeting on Monday, the association expelled the two wrestlers from the sport. Association chief Kitanoumi, who has held sumo's top job since 2002, will be replaced by another former wrestler, Musashigawa. The drugs row is the latest blow to strike the sport, which dates back hundreds of years. Wrestlers are expected to adhere to a strict moral code and to act as role models. But earlier this year, a prominent coach and three wrestlers were charged over the death of a trainee. They are accused of beating the 17-year-old, who collapsed and died in hospital, as a punishment for running away. Mongolian-born Grand Champion Asashoryu has also been in the media spotlight. Last year the so-called "bad boy of sumo" was suspended - the first such move in the sport's history - for missing a training tournament.